Peptide (C)RDLAGKEQRTLTK, corresponding to amino acid residues 301-313 of rat P2X4 receptor (Accession P51577). Extracellular. Homology Mouse - 12/13 amino acid residues identical; human - 11/13 amino acid residues identical. 1-4. Anti-P2X4 Receptor (extracellular) Antibody (#APR-024), (1:200). 2-8. Anti-P2X4 Receptor (extracellular) Antibody, preincubated with the control peptide antigen. Cell surface detection of P2RX4 in intact living PC12 cells. 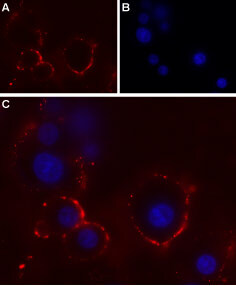 A. Extracellular staining of cells with Anti-P2X4 (extracellular) Antibody (#APR-024), (red, 1:50) followed by goat anti-rabbit-AlexaFluor-594 secondary antibody. B. Nuclear staining of cells using DAPI (blue). C. Merged images of A and B.
Prasad, M. et al. (2001) J. Physiol. 537, 667. Florenzano, F. et al. (2002) Neuroscience 115, 425. Ashcroft, F.M. et al. (2000) Ion Channels and Disease Ed 1, p. 405, Academic Press, San Diego. Khakh, B.S. et al. (2001) Pharmacol. Rev. 53, 107. Le, K.T. et al. (1998) J. Neurosci. 18, 7152. Robertson, S.J. et al. (2001) Curr. Opin. Neurobiol. 11, 378. Dunn, P.M. et al. (2001) Prog. Neurobiol. 65, 107. Inoue, K. et al. (2004) J. Pharmacol. Sci. 94, 112. The P2X purinergic receptors belong to the ligand-gated ion channel family and are activated by extracellular ATP. The structure and function of the P2X receptors, which were mainly investigated using in vitro models, indicate their involvement in synaptic communication, cell death, and differentiation. Seven mammalian P2X receptor subtypes (P2X1–P2X7) have been identified and cloned.1,2,3 All P2X receptor subtypes share the same structure of intracellular N- and C-termini, two membrane-spanning domains and a large extracellular loop. The P2X2 receptor subunit has a widespread tissue distribution in autonomic neurons, but it is generally found to be co-expressed with one or more subtypes. Anti-P2X4 Receptor (extracellular) Antibody (#APR-024) is a highly specific antibody directed against an epitope of the rat protein. The antibody can be used in western blot and immunocytochemistry applications. Anti-P2X4 Receptor (extracellular) Antibody recognizes an extracellular epitope and is thus ideal for detecting the receptor in living cells. It has been designed to recognize P2X4 purinergic receptor from mouse, human, and rat samples. Elkhal, A. et al. (2016) Sci. Rep. 6, 1. Anti-P2X4 Receptor Antibody (#APR-002). This antibody recognizes a different epitope and thus can also be used as a control for detecting P2X4 receptor.